For Chanel Haute Couture Autumn/Winter ’18, Karl Lagerfeld drew from his love of Paris with its rich historical heritage. 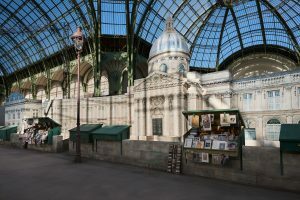 Paying tribute to the city’s literary universe so beloved by bookworms and the Académie Française, the collection was showcased opposite the dome of the Institut de France, the Seine quayside thoughtfully lined with book sellers’ “boxes”. The colour palette whispered of autumn in Paris, featuring the pale grey of zinc rooftops, the anthracite of street asphalt, the black of ink, a deep nocturnal navy, as well as gold and silver reflections of the moon. Taking a gentler turn were more romantic hues: the pale pink and mauve of sunrise, the white, ecru and beige of clouds, and the almond green of the rooftops. Crystal embroideries adorned the pieces like cobblestones, while tulles were netted and embroidered with gold in a way that called to mind the padlocks on the Pont des Arts. Slender silhouettes were cut in tweed, classic or plumetis, along with flannel, velvet, crêpe, lace, taffetas, radzimir and chiffon. Zips embellished with braid stole the show on skirts and jackets with narrow sleeves, splitting the profile or even framing them completely at times. 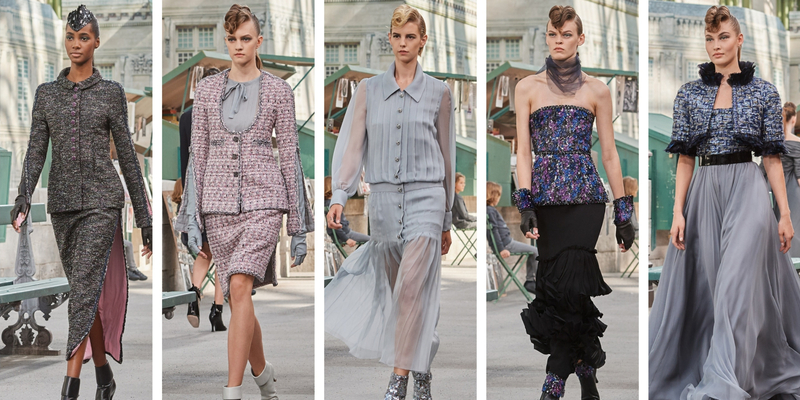 The elegance of Chanel Haute Couture Autumn/Winter ’18 was kept structured, with contrasting linings, zips revealing mini-skirts under longer ones, not to mention jackets that similarly highlighted enhanced waists. The house’s iconic suits continued to play a strong role, sharing the runway with trompe-l’œil dresses and long coats. Think painted organza over embroidered aluminium, or jackets paired with pleated skirts. Then there are chiffon blouses, high band collars and lace tops, and plastrons embroidered with sequins, beads, and crystals. Evening looks were particularly sensual; the shoulders were split and the busts richly adorned, embroidered and draped with bows. By contrast, the skirts and lower part of dresses were more understated, the perfect match for Lagerfeld’s delicate chiffon or tulle sweaters and tops featuring the sort of embroidery that makes Chanel Haute Couture a joy to look forward to each season. Upon closer inspection, a fluid sheath dress boasted a draped and embroidered neckline in lace and silver tissue paper. Another piece in silk georgette made a strong case for structure with its asymmetric drape from the shoulder, while a bustier waistcoat embroidered like a sunset spoke to a long straight skirt in chiffon tiered with flat pleats. More bustiers followed, worn with bubble skirts in frothing tulle. Sequinned boleros glitter like the night sky, as voluptuous skirts teased in white, black or grey chiffon. Chanel‘s iconic black dress came lined with a miniskirt and a zipped bustier in braided tweed or pleated silk georgette. Velvet beckoned on a little black dress with its short silver robe, a long black kimono with its floral-embroidered lining, a top braided with feathers, as well as a long sheath dress finished with an embroidered bustier. Last but not least was the bride, her long straight dress and redingote-effect jacket of pale green tweed embellished with leaves mirroring those worn by members of the French Academy. Scroll through for some of our favourites. Emmanuel Macron says the new cathedral will be “even more beautiful”. A GoFundMe has been started for the 68-year-old supermodel whose Medicare won’t cover treatment in Paris.